Size - 2" x 3" x .9"
The SilverCloud technology is LandAirSea’s most advanced real-time GPS tracking system. Our SilverCloud has been optimized for precision, simplicity and durability. Common applications utilizing the SilverCloud GPS tracker includes ﬂeet management, law enforcement and private investigations. • Fast and user-friendly web-based mapping application with 3D mapping. 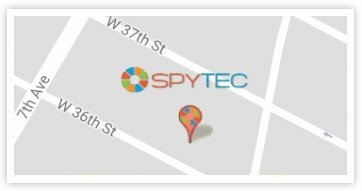 • Stores unlimited GPS tracking data with real-time location that updates as fast as every 3 seconds. location via a URL or an embed code on a website. departure notiﬁcations via text message or emails. • Unlimited detailed activity reports which includes speed, mileage, address locations and stops. • Routing utility offers the ability to send real-time directions to the drivers mobile phone via text message. • Unlimited storage of driving history on our secure server with a user-friendly historical playback feature. • Our online interface has an integrated live chat feature which provides free and instant technical support for questions. • Comes with a one year manufacturer’s warranty. SilverCloud Online user friendly interface makes it easy to locate your vehicles on the map with fast loading times. With the browser based SilverCloud Online, you can access SilverCloud from any type of computer or mobile device. Simultananeous 2D and 3D gives a better perspective to see the surrounding area and where the vehicle is heading. With SilverCloud Online you have a secured administration area and the ability to share your vehicle's GPS position to your friends and family. ShareSpot is also ideal for any form of public transportation such as airport shuttles, taxis or school buses to allow customers to see the GPS location of the vehicle. You can receive automatic alerts from your loved ones or from any public vehicle. Tracking Frequency / Position Update Rate : The SilverCloud is available with the following update rates:3 second, 5 second, 10 second, 1 minute, and 5 minute. Lithium-ion rechargeable battery capable of providing 5-6 days of tracking with average driving (Average driving is 2 hours per day). Works in more than 140 countries. Go to LandAirSea.com for list of countries supported. Unlimited Historical data stored on a secure server. Each plan requires a $29.95 activation fee and customers can cancel or change their plan prior to the next billing cycle. If the plan is canceled, there are no penalties. However, to reinstate service, the $29.95 activation fee will be assessed. Unlike traditional GPS devices, the LandAirSea SilverCloud can be placed in unconventional locations such as a glove box and under a seat and still receive a quality signal. Accurate to within 3 meters (6 feet), The SilverCloud will provide years of reliable service.